The Fellowship was fortunate enough to obtain a copy of PROPHET #21 from Image Comics. Brandon Graham writes, Simon Roy pencils, Richard Ballermann inks, and Ed Brisson letters. This book heralds a new beginning for Rob Liefeld’s Prophet series. The story begins as John Prophet awakens from cryogenic sleep into the alien wasteland that Earth has become. Humans have fallen from technological dominance, and it’s up to our hero to jumpstart the civilization. This book tells (mostly shows, really; not much dialogue as Prophet is alone most of the time) of Prophet’s journey to discover his mission. Artistically we are treated to a brief tour of the ‘new’ world, showing us some of the changes that have taken place in the time that has passed. I like the setup of this story. They have built in some nice potential for epic storytelling, and left the sci-fi front wide open. This story could go in any of a dozen different directions without altering the flavor at all, and possibly hundreds with only minor tweaking. My interest is piqued. 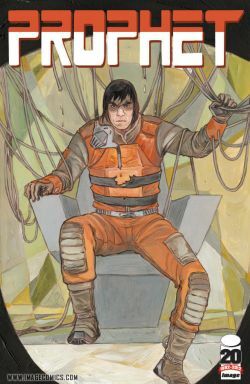 PROPHET #21 is available now at your FLCS or by order from imagecomics.com.